To make a swimming pool the envy of friends and neighbors, the overall setup and features have to be a little over the top. This includes items such as unique lighting for pools, an oddly shaped pool, water features and fun play items. The addition of an outdoor sound system is also a feature to consider. During the hot summer months, the neighborhood is likely to find their second home in your back yard. Their children will become great friends with yours and a lot of neighborhood parties and cook outs are likely to be possible. Both children and adults enjoy a pool slide. It makes the experience more fun allowing for games and interaction between guests. It is ideal to have the slide positioned for swimmers to enter the swimming pool in the deeper section. If a slide is part of the design, refrain from the addition of a spring board. Slides should also be placed where some shade is available since the summer sun can cause the surface to be very hot and uncomfortable on the skin. There are a variety of styles of pool floats available. Some have a hole through the middle which can make for a fun game. Water collects in the holes and children can blow the water out of the floats toward another swimmer. For themed parties, consider having themed inflatable floats available for guests to use. It ties in the theme of a gathering better and offers another element of fun. Floats for children of all ages, including babies and toddlers for safety, are beneficial to have available as well. Select items that are from popular television or movie characters to maintain cool pool status. Having music to listen to while swimming is a lot of fun. An outdoor sound system is an item that puts your pool space over the top. Install the speakers far enough away from the pool where it is impossible for water to get inside. The sound system itself, such as the receiver, satellite system or stereo should be in an enclosed space far from the pool as well. Take requests from guests and play family-friendly music when children are present. Consider the popular music groups or songs and tolerate some that may not be your favorite when catering to guests. Colored pool lights change the aesthetics of how the pool looks for night swimming. It also makes it easier to play diving games or other surface games while in the pool. This is also a safety feature. Lights show where the edges of the pool are for those that prefer to swim under the water. Sometimes it is hard to see the edges and swimming into the side of a pool can cause injury. Colored lights are fun to change for special events. Consider having a specifically labeled set of lights for birthday parties, Independence Day, Memorial Day and other significant dates. There are a variety of water features that can be added to a swimming pool. One to consider is a waterfall. This will be constructed on the exterior of a swimming pool and spill water into the pool. In most cases, this is natural water that is not chlorinated. It helps to filter in clean water into the swimming pool as well. Another feature to consider is water spouts. These are like small geysers that are along the side of the pool and shoot outward in an arch over to the other side. It is fun when jumping into a pool or swimming over the surface. Remember to consider the maintenance needed when adding additional features to a pool area. If you elect to include fun pool toys for children, it is ideal to have a dedicated storage space for these items. 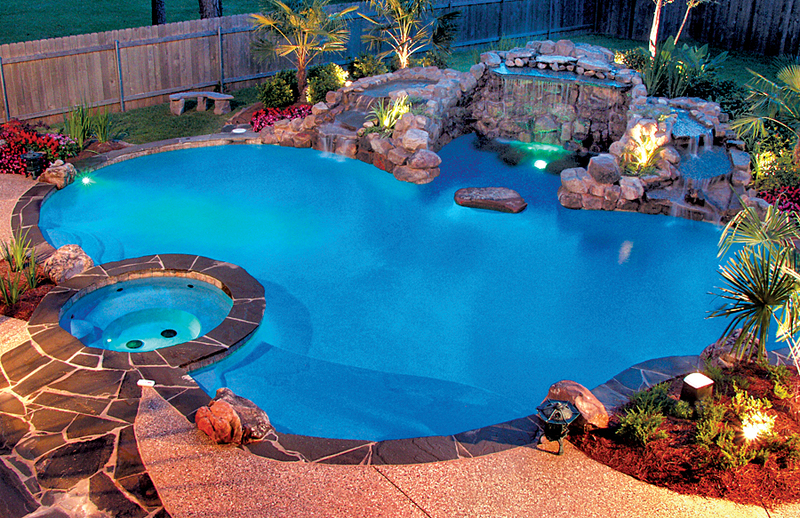 It is also ideal to have extra bulbs on-hand for unique pool lighting should one become damaged or burn out. When a pool gets a lot of use, consider using a robotic cleaner so that you have more time to maintain the space around the pool and maintain the landscaping as well.